At 5 p.m. every day, NC State Ph.D. student Megan Boland feeds her research – literally. 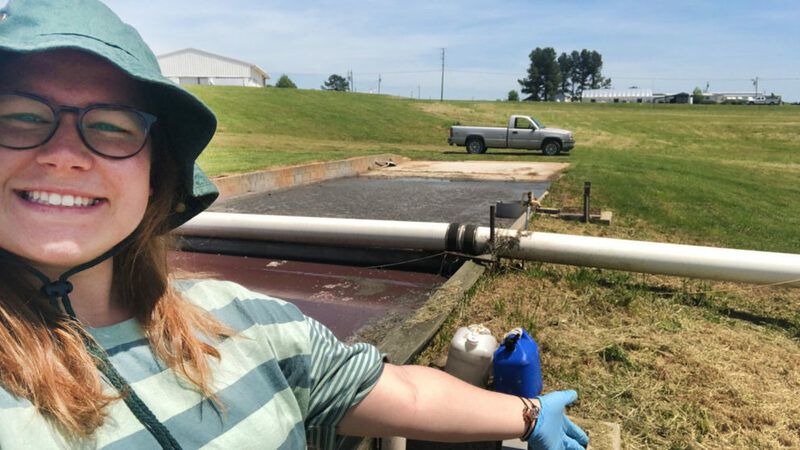 In an upstairs corner of Weaver Labs on NC State’s campus, she operates two small anaerobic digesters. Inside these bioreactors, thousands of microorganisms convert waste into renewable natural gas. Boland’s research explores how and which microorganisms improve biogas production. 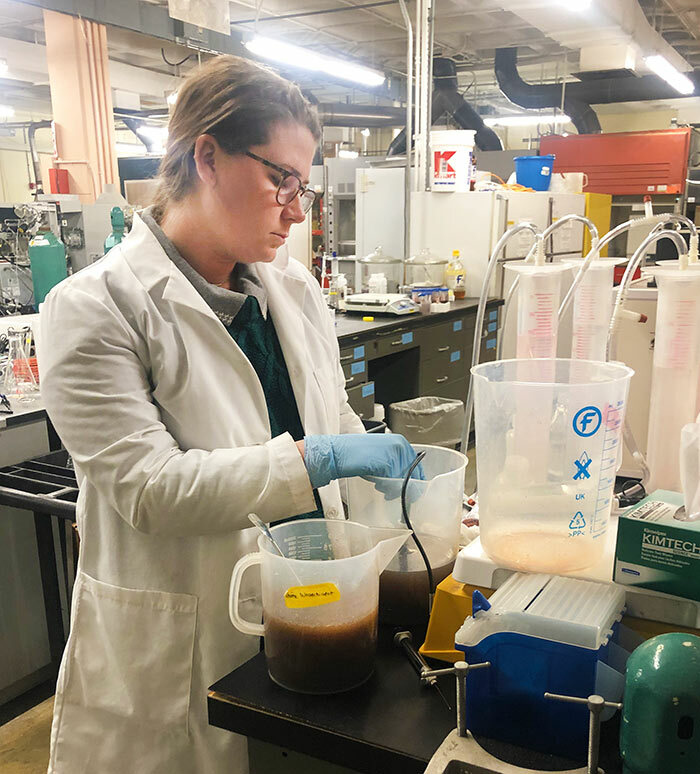 Biological and Agricultural Engineering Ph.D. student Megan Boland prepares material for her research on biogas production. “These microorganisms – mostly bacteria – are living things that have to be fed regularly. If I leave for a weekend, they’re noticeably unhappy because biogas production starts to decrease,” she said. Boland hopes her research can boost the stability of the bioreactors, allowing for more efficient and reliable production of renewable natural gas. “I’m looking at the genes responsible for degrading lignocellulose, which is present in agriculture waste such as switchgrass and corn stover,” said Boland, who works with faculty adviser Jay Cheng. By understanding which microorganisms are in reactors and what they are doing, Boland hopes to improve the biogas production process. That could motivate more farms to use digesters, ultimately creating a greater supply of renewable natural gas. The Ph.D. program in bioenergy and biotechnology is an ideal mixture of Boland’s interests in renewable energy, chemical engineering and research. She coupled her NC State bachelor’s degree in chemical engineering with several research experiences and a trip to explore renewable energy in Iceland. “After Iceland, I knew I wanted to do something with renewable energy,” she said. She also knew she wanted to improve campus sustainability. Boland started compost collection in the Weaver Labs building where her office is based. She also joined the NC State Stewards, a student sustainability leadership program through which she mentors undergraduates. “I am really passionate about helping the first-year Stewards find out what they’re passionate about – that’s something I didn’t discover until my junior year. 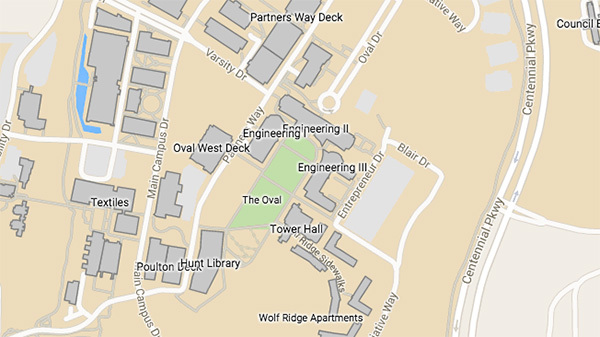 That [discovery] helps students make the most of their undergraduate years,” she said.